Modified JL Tech Tech related bulletin board forum regarding subjects such as suspension, tires & wheels, steering, bumpers, skid plates, drive train, cages, on-board air and other useful modifications that will help improve the performance and protection of your Jeep JK Wrangler (Rubicon, Sahara, Unlimited and X) on the trail. The JL Trailgater is engineered specifically for the 2018 Jeep JL Wrangler and replaces the whole plastic inside tailgate cover. 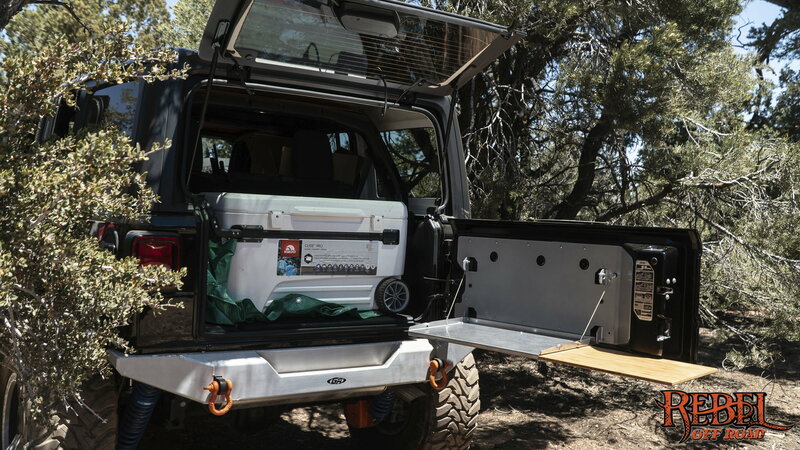 It utilizes the same proven design used for our JK Trailgater, has a larger table and cutting board and mounts to the JL tailgate using 9 proprietary injection molded blind nuts. 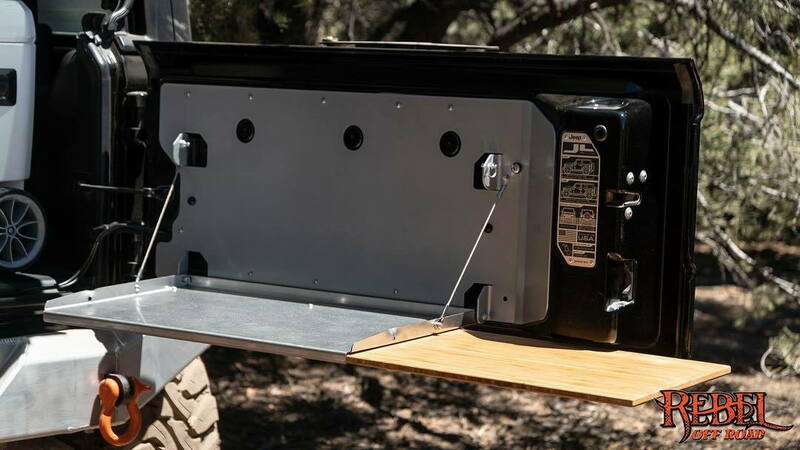 The JL Trailgater also keeps available the 3 mounting points in the center of the tailgate. The Trailgater is designed to be extremely functional, ergonomic and to look fantastic on your JL Wrangler. Stop preparing your food in the dirt. When out on the trail, most of us Jeepers end up serving snacks and meals from the top of a cooler. Quite often, part of the meal ends up in the dirt. The Trailgater is designed to get both you and your food out of the dirt. Whether serving trail snacks or preparing a full meal, the fold down Trailgater utility table can handle your needs. Its large working surface provides ample room for a camp stove and still have room to place cooking utensils, mixing bowls, plates, cups, containers and such. The slide out cutting board enlarges the working surface when needed for cooking, chopping, mixing and preparing food. Visit REBEL OFF ROAD's homepage! All times are GMT -8. The time now is 01:49 PM.